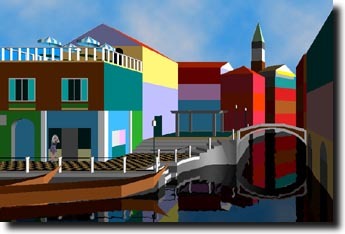 Galleria d'Arte has been a work in progress for several years. Working a few months at a time the vision has remained remarkably steady and I hope to complete it this year. I learned POV-Ray in order to create this image. 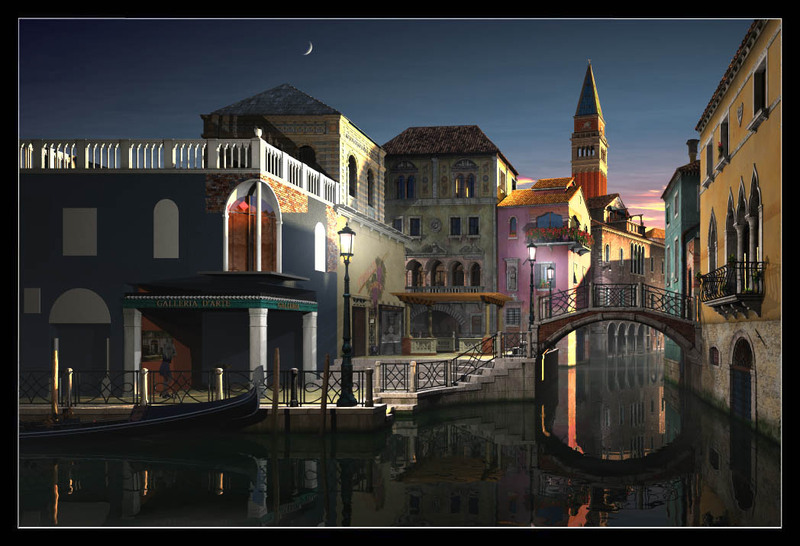 After working out the basic layout using simple shapes I began by adding detail to the more distant buildings. As I gained experience I moved to the closer objects. 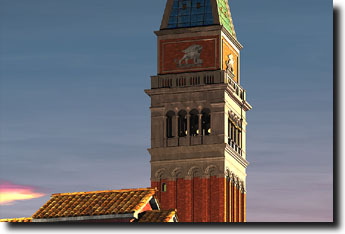 This is Saint Mark's Campanile (a bell tower in Venice), which was the first building I finished. It's a beautiful building with an interesting history. This shows the reflection on the water of the second building I completed. Instead of photorealism I've leaned the image toward a more idealistic painted look, using procedural textures instead of textures derived from photographs. I always look for repeating elements in computer graphic images so I tried to make each element unique in some way, which also fits with the overall theme. I've noticed lamp glow is often visible for some time after sunrise; I also wanted to show brilliant sunlight striking the tops of the buildings, washing out the colors a bit. 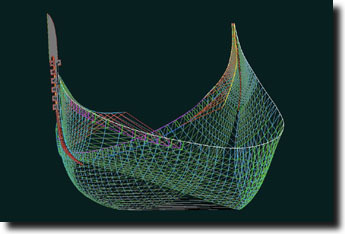 The gondola was a difficult subject, its curves within curves and lack of symmetry required me to draw its body using polygon meshes. 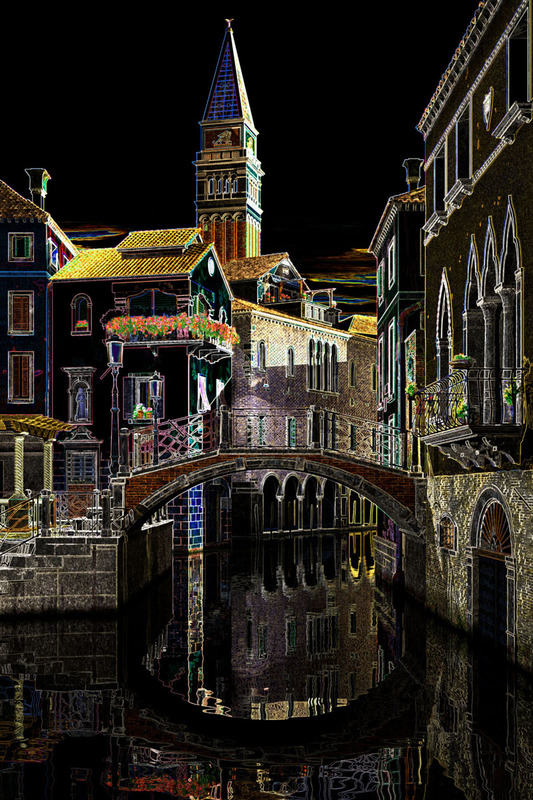 While it lies in shadow I still wanted it accurate so I obtained drawings from Thom Price, a gondola builder in Venice at the time. 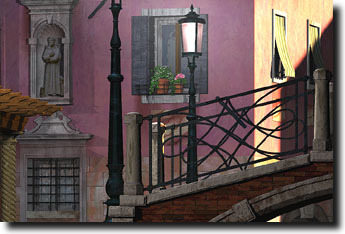 Drawing the gondola led me to truly appreciate this beautiful and exotic craft. 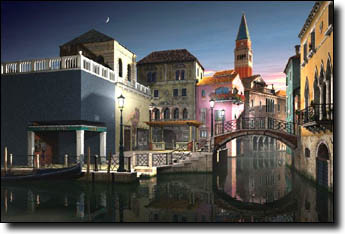 The "Galleria d'Arte" concept is a bit of fantasy, each building representing a piece in the gallery that is Venice. 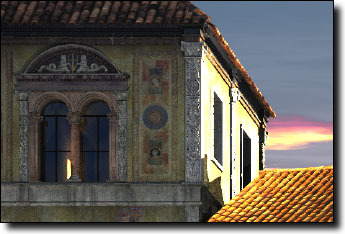 Here I've included an element from the Loggia del Consiglio in Verona. At the time of the Loggia's construction, the late fifteenth century, Verona was a part of the Venetian Republic. I used a one-point perspective to reduce diagonal lines, giving the scene a more static and peaceful feel, a popular style for european street scenes. 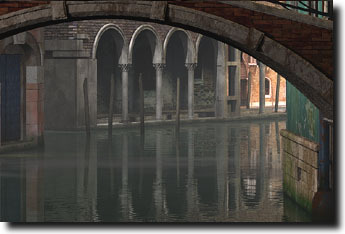 This image shows the same scene in a two-point perspective; pass your pointer over the image to see the difference. 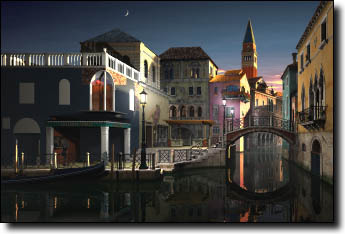 I produced this alternate version of the Venice scene as a Valentine. The glowing neon colors are especially beautiful when displayed backlit. 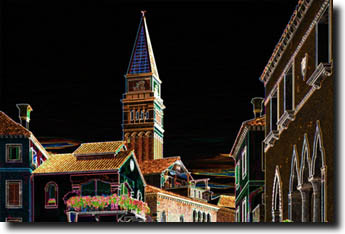 A version of this image is available for purchase at Zazzle.